Frinton Golf Club provides a true seaside challenge to golfers of all standards. Founded in 1895, with the original course layout being designed by Willie Park Jnr. The current Havers Course was upgraded by the legendary golf course architect Harry Colt. Although only 6249 yards in length, Colt created a classic golfing challenge for all abilities. Situated on the enviably picturesque north Essex coast, Frinton Golf Club is home to a jewel of a course and is an ideal venue for Golf Societies – all year round. Our tees and greens are open in all but the most severe conditions, meaning that you can play even when other nearby courses are closed! 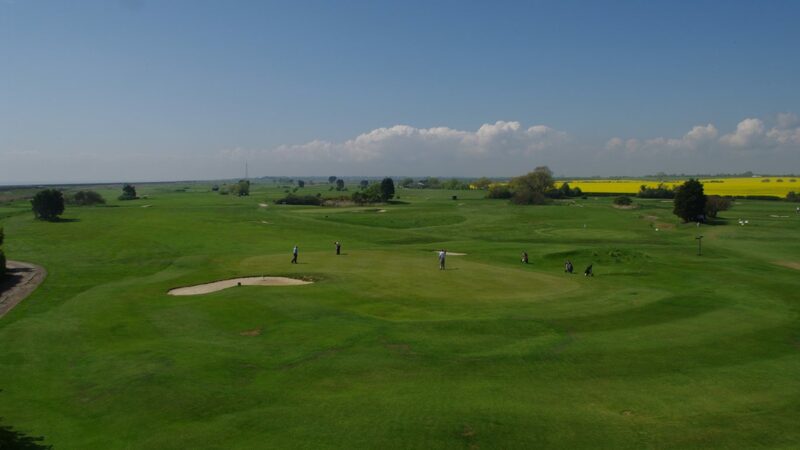 Our 18 hole Havers Course (named after 1923 Open Champion, Arthur Havers, who was Club Professional at Frinton for many years) offers easy-walking with fast, undulating greens which will test even the best putters. The ever-changing sea breeze will require you to select your clubs carefully for each shot, especially to avoid the number of tidal fletes that traverse the course. In addition, we have our 9 hole Kirby Course which can provide either ‘warm-up’ or ‘post-lunch’ variety for your day. A memorable day-out is guaranteed by the friendly service in our refurbished, historic clubhouse. Our in-house catering staff can prepare meals to suit your particular requirements, from hearty breakfasts or bacon rolls to light lunches or formal dinner served in a private dining room. The choice is yours. Every Society visit is important to us. On arrival, you will be greeted by one of our golf professionals who will introduce you to the course and, if asked, offer useful strategies for your players. Packages can be arranged to suit all requirements. We look forward to welcoming you! seafront in Frinton on Sea. art deco Lounge overlooking the course.